Against all odds, the International Campaign to Ban Landmines helped to enact a global treaty banning antipersonnel mines in 1997. For that achievement it was awarded the Nobel Peace Prize. In this volume, Leon Sigal shows how a handful of NGOs with almost no mass base got more than 100 countries to outlaw a weapon that their armies had long used. It is a story of intrigue and misperception, of clashing norms and interests, of contentious bureaucratic and domestic politics. It is also a story of effective leadership, of sustained commitment to a cause, of alliances between campaigners and government officials, of a US senator who championed the ban, and of the skilful use of the news media. Despite this monumental effort, the campaign failed to get the United States to sign the treaty. Drawing on extensive internal documents and interviews with US officials and ban campaigners, Sigal tells the story of the in-fighting inside the Clinton administration, in the Pentagon, and within the ban campaign itself that led to this major setback for an otherwise unprecedented, successful global effort. 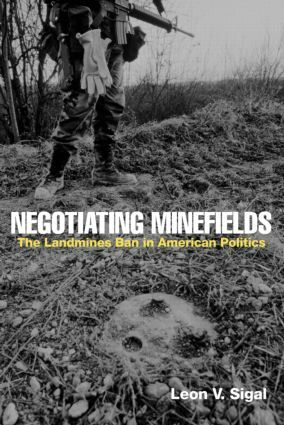 Negotiating Minefields will be of interest to students and scholars of military and strategic studies and politics and international relations.